Chamomile is used primarily to treat stomach cramping and pain, including menstrual cramping and diarrhea. Aside from the treatment of aches and pains, doctors and researchers have found that chamomile can be used effectively to treat skin and eye problems, mood disorders, and even the flu. For stomach problems, prepare a soothing chamomile tea using a mixture of one ounce of chamomile, two thirds of an ounce of peppermint, one ounce of caraway seeds, and two thirds of an ounce of angelica. For a cup of tea, add one teaspoon of this mixture to one cup of hot water. Steep for 10 minutes, strain, and drink. For skin problems, prepare a healing chamomile tea using a mixture of one ounce of chamomile, one ounce of dandelion, and two thirds of an ounce of fennel. For a cup of tea, add one teaspoon of this mixture to one cup of hot water. Steep for 5 to 10 minutes, strain, and drink. This tea helps stimulate metabolic activity that aids in the healing of inflammatory skin conditions. Chamomile is mild enough for everyday use, and almost everyone can enjoy it�unless you have a ragweed allergy, in which case it should be avoided. One cup of brewed chamomile herbal tea provides 2 calories, 0.5 g carbohydrate, 0 g protein, 0 g fat, 0 g dietary fiber, and 2 mg sodium. Everybody has seen the silly �Chia Pet,� a ceramic pot for growing chia greens. What you may not have known is that chia is a SuperFood! Chia seeds form a gel in the stomach that slows the conversion of carbohydrates to sugar, and the protein in the gel helps build muscle and other tissues. Chia also provides the trace mineral boron, which aids in the absorption of calcium. The seeds are high in omega-3 fatty acids and anti-inflammatories. One tablespoon of chia seeds provides 40 calories, 5 g carbohydrate, 2 g protein, 4 g fat, 5 g dietary fiber, 6 mg vitamin C, 76 mg calcium, 1.8 mg iron, 150 mg phosphorus, 38 mg magnesium, 85 mg potassium, 2406 mg omega-3 fatty acids, 792 mg omega-6 fatty acids, 294 mg omega-9 fatty acids. Cinnamon is one of the most popular herbs and spices. In one study, eating a gram of cinnamon per day appeared to reduce fasting blood glucose concentration and improve the blood lipid profile in patients with type 2 diabetes. Cinnamon is also rich in anti-inflammatory compounds. In traditional medicine, it is recommended to treat indigestion, nausea, vomiting, upset stomach, diarrhea, and flatulence. One teaspoon of ground cinnamon provides 5 calories, 1.6 g carbohydrate, 0.1 g protein, 0.1 g fat, 1.1 g dietary fiber, 5 IU vitamin A, 1 mg vitamin C, 1 mcg folic acid, 10 mg potassium, 1 mg sodium, 1 mg phosphorus, 25 mg calcium, 0.76 mg iron, 1 mg magnesium, and 0.33 mg manganese. Cloves contain significant amounts of an active component called eugenol, which has been the subject of numerous health studies, including studies on the prevention of toxicity from environmental pollutants such as carbon tetrachloride, digestive tract cancers, and joint inflammation. In the United States, eugenol extract from cloves has often been used in dentistry in conjunction with root canal therapy, temporary fillings, and general gum pain, because eugenol and other components such as beta-caryophyllene make cloves a mild anesthetic as well as an anti-bacterial agent. Because of these beneficial effects, clove oil is also found in some over-the-counter sore throat sprays and mouth washes. The addition of clove extract to diets already high in anti-inflammatory components such as cod liver oil, with its high omega-3 fatty acid content, brings significant added Benefits and, in some studies, further reduces inflammatory symptoms. Cloves contain a variety of flavonoids, including kaempferol and rhamnetin, which contribute to their anti-inflammatory and antioxidant properties. One teaspoon of ground cloves provides 6 calories, 1.2 g carbohydrate, 0.1 g protein, 0.4 g fat, 0.7 g dietary fiber, 11 IU vitamin A, 2 mg vitamin C, 2 mcg folic acid, 22 mg potassium, 5 mg sodium, 2 mg phosphorus, 13 mg calcium, 5 mg magnesium, and 0.6 mg manganese. Coriander is considered both an herb and a spice, since both its leaves and its seeds are used as a seasoning condiment. Fresh coriander leaves are more commonly known as cilantro; it bears a strong resemblance to Italian flat-leaf parsley. Coriander seeds have a health-supporting reputation that is high on the list of the healing spices. In parts of Europe, coriander has long been referred to as an �anti-diabetic� plant. In parts of India, it has traditionally been used for its anti-inflammatory properties. In the United States, coriander has recently been studied for its cholesterollowering effects. In a study where coriander was added to the diet of diabetic mice, it helped stimulate their secretion of insulin and lowered their blood sugar. Another study demonstrated that when given to rats fed a high-fat, high-cholesterol diet, coriander lowered levels of total cholesterol and low-density lipoproteins (LDL), or �bad� cholesterol, while actually increasing levels of high-density lipoproteins (HDL), or �good� cholesterol. Research also suggests that the volatile oils found in the leaves of the coriander plant may have antimicrobial properties. One-fourth cup of fresh coriander leaf (cilantro) provides 1 calorie, 0.1 g carbohydrate, 0.1 g protein, 0 g fat, 0.1 g dietary fiber, 111 IU vitamin A, 22 mg potassium, and 4 mg calcium. 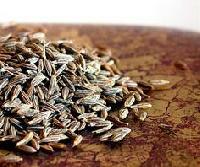 Cumin seeds are a very good source of iron, a mineral that plays many vital roles in the body. Cumin has traditionally been thought to benefit the digestive system, and scientific research is beginning to bear out cumin�s age-old reputation. Research has shown that cumin may stimulate the secretion of pancreatic enzymes, compounds necessary for proper digestion and nutrient assimilation. Cumin seeds may also have anti-carcinogenic properties. In one study, cumin was shown to protect laboratory animals from developing stomach or liver tumors. This cancer-protective effect may be due to cumin�s potent free radical scavenging abilities as well as the ability it has shown to enhance the liver�s detoxification enzymes. One-fourth teaspoon of ground cumin provides 3 calories, 0.2 g carbohydrate, 0.1 g protein, 0.1 g fat, 0.2 g dietary fiber, 3 IU vitamin A, 11 mg potassium, 1 mg sodium, 5 mg calcium, and 0.2 mg iron. Dandelion is rich in calcium, which is essential for the growth and strength of bones. It is rich in antioxidants like vitamin C and luteolin, which protect bones from age-related oxidant damage. Dandelion juice is a diuretic and may stimulate insulin production. Dandelion is also used as a vegetable; it�s a good source of fiber. Dandelion greens are rich in vitamin C and are among the best vegetable sources of beta-carotene. They provide potassium, iron, calcium, magnesium, phosphorus, and the B vitamins thiamine and riboflavin. One-half cup of raw dandelion greens provides 45 calories, 9 g carbohydrate, 2.7 g protein, 0.49 g fat, 3.5 g dietary fiber, 4931 IU vitamin A, 35 mg vitamin C, 4.8 mg vitamin E, 273.7 mcg vitamin K, 27 mcg folic acid, 187 mg calcium, 2959 mcg beta-carotene, 0.17 mg copper, 3.1 mg iron, 36 mg magnesium, 66 mg phosphorus, 397 mg potassium, and 76 mg sodium. Endive, which is the second growth of the chicory plant, can be pale yellow or purple in color and has a pungent, bitter flavor. Endive is a good source of potassium, calcium, magnesium, iron, zinc, B vitamins, folic acid, vitamin C, and selenium. Endive is rich in compounds that help boost the immune system, detoxify the body, promote regularity, lower the risk of cataracts, and protect the heart. This crisp, lettuce-like vegetable makes a unique addition to salads. It can also be served as a hot side dish if steamed or saut�ed. One-half cup of chopped, raw endive provides 4 calories, 0.8 g carbohydrate, 0.3 g protein, 0.1 g fat, 0.8 g dietary fiber, 513 IU vitamin A, 2 mg vitamin C, 36 mcg folic acid, 79 mg potassium, 6 mg sodium, 7 mg phosphorus, 13 mg calcium, and 4 mg magnesium. 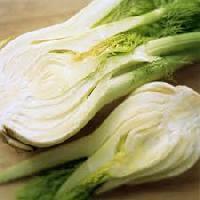 Fennel is a popular vegetable, spice, and flavoring, as well as an ingredient in traditional medicines. It is one of the key flavorings in absinthe. Fennel contains an anise-flavored compound called anethole, which is a potent antimicrobial against bacteria, yeast, and fungi. A lab study has shown anethole to be effective against some kinds of intestinal worms. Anethole may have some analgesic, or painreducing, effects and some anti-convulsant effects as well. Anethole also acts as a phytoestrogen. One cup of raw fennel bulb slices provides 27 calories, 6.3 g carbohydrate, 1.1 g protein, 0.1 g fat, 2.7 g dietary fiber, 117 IU vitamin A, 10 mg vitamin C, 23 mcg folic acid, 360 mg potassium, 45 mg sodium, 44 mg phosphorus, 43 mg calcium, and 15 mg magnesium. Fenugreek seeds are hard, yellowish brown, and angular. Both Indian Ayurvedic medicine and traditional Chinese medicine recommend it to treat arthritis, asthma, and bronchitis, and to improve digestion, maintain a healthy metabolism, increase libido and male potency, cure skin problems (such as wounds, rashes, and boils), treat sore throat, and cure acid reflux. Fenugreek also has a long history of use for the treatment of reproductive disorders� to induce labor, to treat hormonal disorders, to help with breast enlargement, and to reduce menstrual pain. Recent studies have shown that fenugreek helps lower blood glucose and cholesterol levels, and may have potential against diabetes and heart disease. One teaspoon fenugreek seed provides 13 calories, 2.3 g carbohydrate, 0.9 g protein, 0.3 g fat, 1 g dietary fiber, 2 IU vitamin A, 2 mcg folic acid, 31 mg potassium, 3 mg sodium, 12 mg phosphorus, 7 mg calcium, 1.34 mg iron, and 8 mg magnesium.